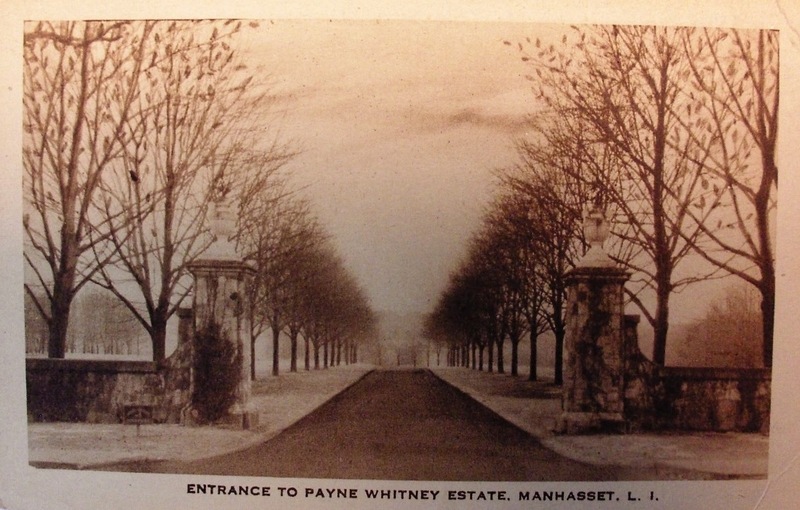 The entrance to 'Greentree', the Payne Whitney estate designed by d'Hauteville & Cooper c. 1903 in Manhasset. Click HERE and HERE for more on 'Greentree'. Interesting there are no gates, just a small sign posted on a stake in the grass to the left. I'm guessing it reads, "Private Property No Trespassing." I wondered how long that worked? There were no gates when I visited during the 1980s, but one without business would not have gotten very far. I believe the small sign just says "greentree" and provides the street address. While the drive has been relocated (no longer straight) there still are no gates. A gatehouse still guards the entrance a 1/4 mile in. 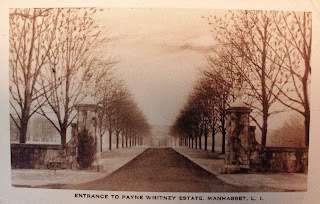 On a unrelated note, the rumor mill in Manhasset reports that Inisfada has received a number of offers, most of which have come from groups looking to build a church on the property. Most proposals include full or partial demolition of the mansion. Reports further state that estimates for removing the house top $7M. Mrs. Brady's private chapel has been donated to Fordham. Tours of the house continue until the Jesuits depart on June 1st. If you havent been into the house, go now. The Jesuits have taken great care of the interior although the grounds have suffered esp. after Sandy. All bets are off when the house is vacated. It is great loss for Long Island and Manhasset in particular. A beautiful and haunting photo. Reminds me of many of the "Wheatly" photographs seen here. I may be wrong, but I don't think many "regular folk" would dare venture up the drive even without a gate in the day. I think people of my class rarely or never toured many of the wealther neigborhoods for fear of be choosen out by law officals as not belonging to the area. Very,very sad about Inisfada,but I'm not surprised, Long Island seems to be a hot-bed of tastelessness and lack of concern about the past.